After my chair class in 2007, I decided to build a Windsor-style stool that the teacher, Brian Cunfer, had in his shop. A stool lets me build my tool collection progressively: I wouldn’t need a steam box since the stool has no back. I figured I’d build one as practice and paint it, then build one out of my stash of walnut with a natural finish. I got as far as turning the legs and stringers, before feeling my lack of a bench. 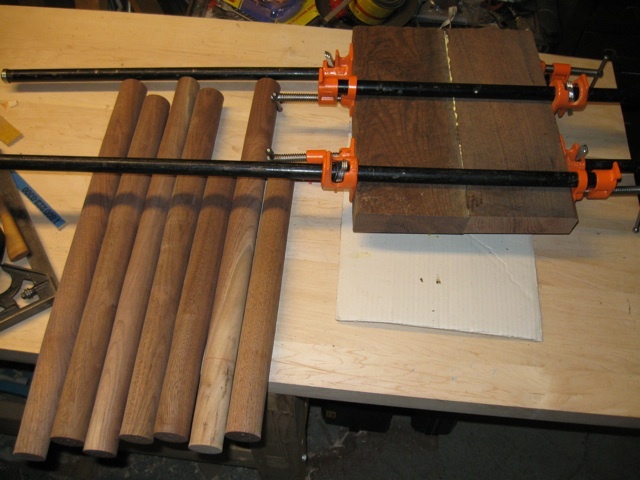 You might notice that the legs and stringers are made of at least 4 different kinds of wood: they were all what I had sitting around in the right size. This hopefully won’t be noticeable under paint. Now that my bench is usable, I’ve picked up where I left off. Over the past week or so, I pieced up the seat, cut it out, shaped the outside edge, and today I drilled the leg holes. Now, I’m waiting for more tools to carve the seat. The inshave I had was really not the right shape, so another one should be coming in the mail soon. In the mean time, I’ve started cutting up my walnut for the second stool. It has a lot of knots, and the pith is throught middle of some pieces. But I found enough straight, clear wood for the seat, and I rounded enough sticks for the legs and stringers. Tonight I glued up the seat blank. 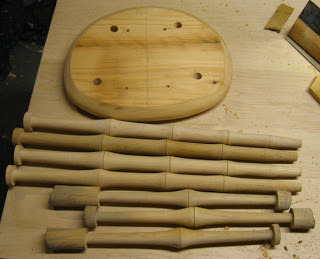 Next, I’ll probably turn the legs and stringers, while I wait for the seat carving tools to arrive.